“KALARRYTES” is a beautiful preserved village of the Perfecture of Ioannina, situated on the west border of mount Pindos at 1200 m. altitude. The wild and mild beauty of the landscape, being unapproachable and incomparable, made the habitants to engage in developing commerce, thus some getting out of Greece, to be educated, to get wealthy, and to become famous across the boarders of the native place. From 1430 to 1480 Kalarrytes preserved their independence from the Turkish occupation. Consecutively, they passed under the dominion of Valide Sultana, gaining many tax reductions. These privileges were kept until 1803, when Ali Pasha annulled them. Kalarrytes and approximately 45 villages formed an Independent Federation, with capital Kalarrytes. They had developed cattle breeding, agriculture, wool industry, silver and gold art, and the famous art of goldsmiths. A special part in the history of art is the occupation of people of Kalarrytes with gold and silver. Their village sounds of hammer and anvil strokes and create art masterpieces, jewellery and ecclesiastic items. The “KALARRYTES” Cultural and Traditional Organization was established in 1986 and continues successfully to this day to grow and preserve the traditions of this historic village, in an effort to preserve and spread the long standing historic tradition and culture. 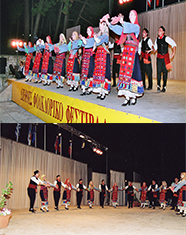 An important event for the city of Ioannina and for all region of Epirus is the International Folk Festival being organized by the ardent desire and love by the Kalarrytes Cultural and Traditional Organization, every year since 1987. Through the Festival, which has become a steady institution, everybody has the opportunity to get to know and experience first-hand the tradition of each participant country; their tales, history and the national identity of each dancing group. Through the Festival the public gets the opportunity to learn about the cultural inheritance of countries with a diverse way of living than our own. This activity of the Kalarrytes Cultural and Traditional Organization is not only an imperative request of our times but also a national duty of high importance. The survival of tradition and popular civilization is today an oasis through the endless desert of standardization, technocracy, and necrosis of the soul. It is also a rapprochement of population and better acquaintance that lifts nationalistic passions and lays the foundations for a peaceful coexistence between people. One of the many aspects of the Kalarrytes Cultural and Traditional Organization is the dancing one. It consists of three levels, beginners, advanced (performances level), and children level. 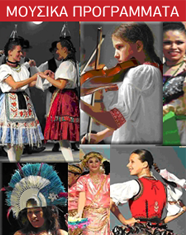 On all levels authentic traditional dancers are taught dances and customs. As well as under the constant supervision of the Board of Directors and the remarkable teachers, the improvement of the dancers personality is achieved, the development of strong close relationship is taking place, with result to consider the Organization as a part of oneself. 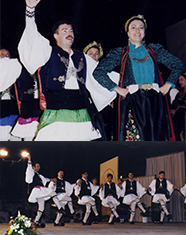 Under the long and constant effort for the recreation of capable and remarkable dances, the Organization has met with many and honorary awards in Greece and abroad, giving more than 600 performances worldwide. 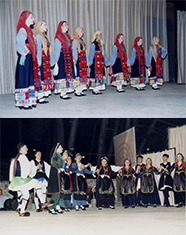 It is considered by many to be one of the most famous folk groups in Greece. 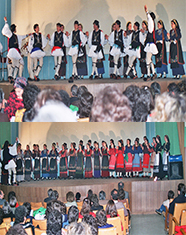 The Kalarrytes Cultural and Traditional Organization is a founding member of the Greek National Section of CONSEIL INTERNATIONAL DES ORGANISATIONS DE FESTIVALS DE FOLKLORE ET D’ ARTS TRADITIONNELS (C I O F F ®).